Although we say no experience is necessary at iPaddle Miami we offer private Paddleboard Lessons with our certified PaddleFit Coach Aymee. Learn proper Stand Up Paddle stroke technique, paddle effectively and efficiently. Improve your balance, strength and learn how to engage your core for a full body work out. We strongly emphasize safety and adhere to local legal equipment requirements to be safe and get the most out of your time on the water. 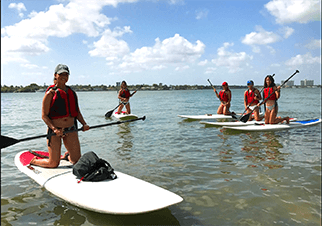 Beginners SUP Class: Learn how to get on the board, balance, the four phases of SUP stroke, crossbow and safety principals to be safe on the water and enjoy your experience to the maximum. Advanced SUP Class: Learn to sprint, buoy turns, race starts and more!